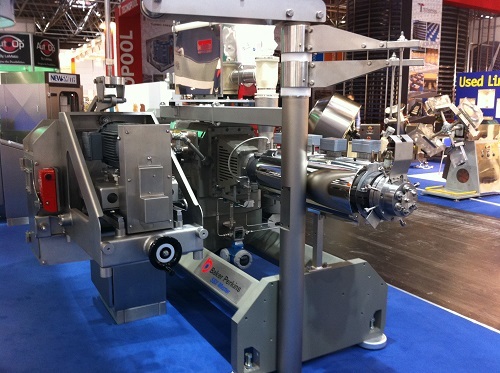 Baker Perkins’ ability to extend and improve the performance of existing cereal lines with minimal investment was highlighted at Interpack 2011 (Hall 4 Stand C17). Baker Perkins Cereal Master™ systems incorporate designs for both extruded and traditionally cooked cereals production. The range is represented on the Interpack stand by an SBX Master™ extruder with a co-extrusion die, and a pillow crimper. Twin-screw cooker extrusion is a reliable and versatile process suitable for both established companies and new entrants to the market. Co-extrusion equipment, flaking rolls, shredders, toasters and cereal cookers units are available enabling high added value cereals such as flakes, filled pillows and multigrain products to be made from the same standard extruder. A coating system adding value through frosting or glazing is a further possibility. The principle of expandable lines is also applied to traditional cereal processes in the Cereal Master TX™ system. Based on steam cooking and flaking of grains, the standard process can be extended to incorporate a wide variety of single and multigrain flake products with either a frosted or glazed coating. Baker Perkins provides the process and engineering expertise to reconfigure existing lines, and works with customers to develop new product ideas, often in the Baker Perkins Innovation Centre, where a comprehensive range of equipment is available for trials. Each installation is individually specified to match the customer’s exact product needs.